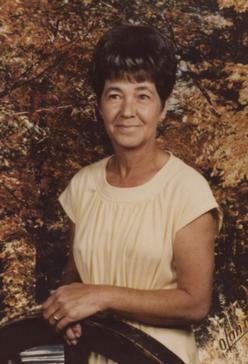 Funeral service for Shirley Ann Thornton Gifford Shockley, 81, Lawrence will be held 10 a.m. Saturday, November 3, 2012 at Warren-McElwain Mortuary in Lawrence. Burial will follow at McLouth Cemetery. She died October 30, 2012 at Pioneer Ridge. She was born on April 2, 1931 in McLouth, KS, the daughter of Thomas Dewey and Louisa (Martin) Thornton. She graduated from McLouth High School and moved to Lawrence where she worked as a waitress at the Deluxe Cafe?. Later she worked at the Sirloin and Don’s Steak House where she made all the salad dressings and her own onion and pepper rings. She also worked for the University of Kansas. She loved working outside in her yard, cooking, camping and watching KU basketball. She married Kenneth Gifford in Wilmar, AR. They later divorced. She then married Robert Preisner and then Ivan Shockley, they both preceded her in death. Survivors include her three children, Linda Powell, Branson West, MO, Brett Gifford, Ft. Smith, AR, Bruce Gifford, Eudora, KS; sister, Janice Luber, Lawrence; one granddaughter, Lisa Lovell Bryant; two great grandsons, Clayton and Chad Bryant all of Tonganoxie, KS; two step granddaughters, Trisha Powell and Krista Bennett; five step great grandchildren, Ali, & Andrea Bryant, Brendan Hecker, Kenzi & Korbin Dowdell, and many nieces and nephews. She was preceded in death by her parents; brothers, James Thornton, Gene Thornton, Chuck Thornton; and sister, Betty Bower. The family will greet friends 6:30 – 8 p.m. Friday, November 2, 2012 at the mortuary. Memorial contributions may be made in her name to Visiting Nurses and may be sent in care of the mortuary.